By air, flights to Kirkwall Airport in Orkney are available from Aberdeen, Edinburgh, Glasgow, Inverness and Shetland, with connecting flights from more distant locations. If you intend to come by sea there are three ferry companies which will take you, though all three involve traveling to the North of Scotland. Citylink buses, Megabuses, and ScotRail trains will all take you up to Caithness or Aberdeen. If you decide to drive, you will enjoy one of the most relaxing drives of your life. As Bill Bryson stated, north of Inverness, there's nothing to crash into! Northlink Ferries operates daily ferries from Scrabster, near Thurso, to Stromness. You can take your car, and the crossing lasts 1½ hours. 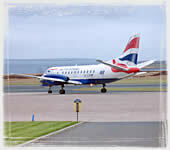 Northlink also operate an Aberdeen - Kirkwall - Lerwick service. This service allows you to take your car, and though it takes longer, about 6 hours for each leg of the journey, the boats are supremely comfortable. Pentland Ferries offers a car ferry from Gills Bay in Caithness, to St Margaret's Hope in South Ronaldsay. The crossing lasts 1 hour. Finally, there is the John O' Groats Ferry which travels from John O' Groats to Burwick in South Ronaldsay. This crossing only lasts 45 minutes, but is passenger only. There are, however, connecting buses from Burwick to Kirkwall. Though it may seem complicated, these travel companies can be contacted and are very helpful, and the effort is very well worth it! Our extensive timetable makes travelling to Orkney and Shetland more convenient and comfortable than ever before. With NorthLink you can choose from up to three sailings each day from Scrabster to Stromness in Orkney and nightly sailings from Aberdeen to Lerwick in Shetland - with four of these sailings going via Orkney's capital, Kirkwall. Take the 21st century Pentland Firth crossing to Orkney with Pentland Ferries. The crossing takes approximately one hour and is the shortest and quickest sea route to Orkney with your car. We sail from Gills Bay in Caithness to St Margarets Hope in Orkney with up to four sailings a day. From Marwick to Hoy and beyond photo © Fraser Dixon, Aeroplane at Kirkwall airport photo © Magnus Dixon. All text © Magnus Dixon.